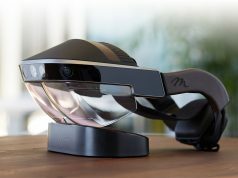 Meta is a successful Kickstarter project that claims to be making “the most advanced augmented reality glasses.” Now that the Kickstarter is over, the glasses have become available for pre-order directly through the Meta website. The unit is expected to be delivered starting in November 2013. The Meta Kickstarter ran its course for 30 days, between May 17th and June 16th. The Kickstarter campaign nearly doubled their goal, finishing at $194,444. 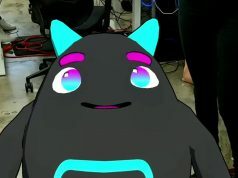 The depth camera is used to captured the wearer’s hands as input, allowing them to manipulate on-screen content by reaching out and (visually) touching it. 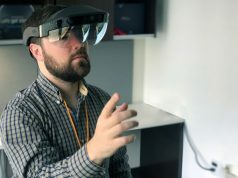 The company also says that the depth camera uses time-of-flight technology, similar to that found in the forthcoming Kinect 2.0, which is said to significantly reduce latency over other methods. Meta differs substantially from Google Glass, the latter being more akin to ‘data glasses’ than augmented reality glasses. While the Meta project looks a bit rough around the edges, the company has significantly bolstered their creditiblity by bringing on board Professor Steve Mann as their Chief Scientist and Professor Steve Feiner as their Lead Advisor. Both are highly respected in the fields of augmented reality and wearable computing. I’d be interested in hearing if anyone has tried out this hardware or even spoken with someone who has. I originally supported the Meta Kickstarter, but backed out due to lack of feedback and obvious graphical shine making it too good to be true. Being a part of the Oculus Rift campaign has given me a better understanding in the hardware limitations, technical availability, and other issues — the transparency of the development however left me hopeful and understanding to their future when delivery occurred; as opposed to the disappointment that I’m afraid the Meta may be delivering. Of course I’ll be thrilled to be wrong. It would be great if it work the way it is shown in videos. The realism of the rendering of 3d thru the lens glasses in the video looks just as real as real life. But i think it would appear a little blurry like google glass. This will never as real as with the Rift for example. If some third party build a perfect hand tracking for the rift and also build HD cameras to get feedback of the real world and attach it to the Rift, the project above would be obsolete. They have posted another video, testing their system, on their website and it seems to be a more realistic picture of what will be the final result. But quite appealing IMO though, if they polish that a bit! My main concern with the Meta is the FOV they’re showing in the concept videos, and the stated 23 degree FOV of the device. They may have a very interesting device, but it’ll be a guaranteed letdown based on that spec alone. It’s the Google Glass mistake all over again. Agreed, the concept video shows stuff that’s still a long way off. I hope they aren’t setting people up for disappointment. I think people is not aware of the enormous challenge that AR is compared to VR. It’s basically the same unresolved problem that is holding up the appearance of autonomous robots. The core of the problem of an AR system is the *perception of the environment* so that synthetic data can be drawn over what the user sees in a *coherent* and seamless way. This implies the use of an artificial intelligence that is capable to *understand* the world we live in from the data of the sensors that are feeding the system (cameras, depth camera, laser scanner…) Some success can be achieved in very specific situations with strong constraints (same happens with robots). Compared to this challenge, making the AR goggles itself is piece of cake. But there won’t be a system generating AR content for those goggles in many, many years – even decades. At least not in the way we think about AR. So true. Yet it is perceived as a “lighter” technological device simply because of it’s size – if anyone stopped to think about that statement they’d realise how ridiculous that sounds.